When My Dining Partner (MDP) received an email about a Groupon for Wild Turkey Smokehouse in Sunnyside, I was skeptical. What exactly is this smokehouse? I wondered. Their website isn’t exactly glamorous. But, I told MDP to get the Groupon anyway–on a whim–and we tried it tonight. Situated on a quiet street south of Queens Boulevard, Wild Turkey Smokehouse is easy to miss. Its door is decorated with Seamless and Grub Hub stickers–their website is hooked directly into Grub Hub–and just inside is a long bar with a handful of tables spread around a pool table in the rear. Our waitress was also the bartender, and so, was extremely busy with various patrons. She did her best to accommodate everyone, but, truth be told, Wild Turkey needs to hire some waitstaff, especially if they expect to generate a returning-customer crowd. Their 8.5 x 11 stapled menu expresses the level of sophistication exuded by the restaurant itself, but that’s not a bad thing. I appreciated Wild Turkey’s simple decor and flavor. Comfort favorites like onion rings and beer-battered mozzarella sticks figure prominently on the first page of the menu, and a lengthy list of sandwiches and burgers makes an impression on the second page. On the final page, there’s a short drinks list, that, for some reason, doesn’t include alcoholic drinks (which they have aplenty), but features a San Pellegrino beverage (that they didn’t have) and ginger ale, a crowd favorite according to their website. We opted for the onion rings and truffle macaroni and cheese to start. While the onion rings were fairly standard, the macaroni and cheese tasted extraordinary. 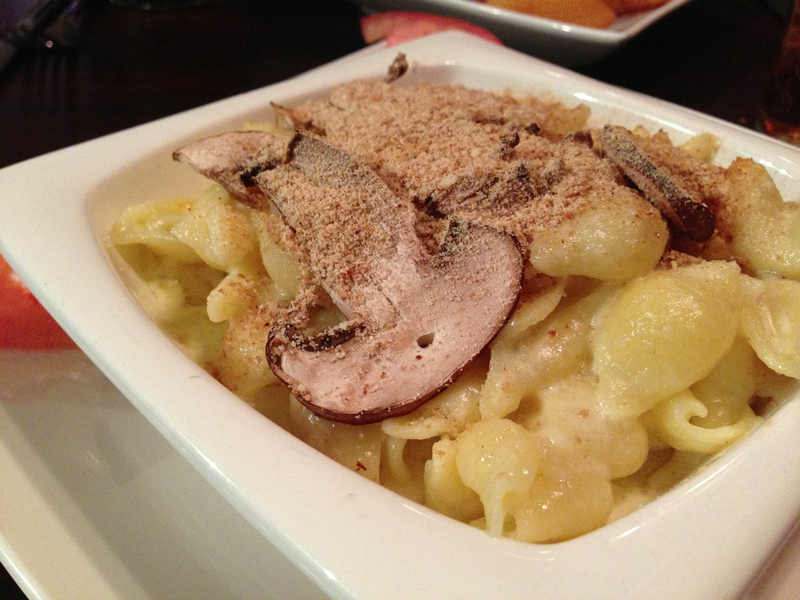 Made with gruyere and a bechemel sauce, the mac and cheese was extremely creamy and delicious. For entrees, we ordered the pulled pork sandwich and the mushroom and gruyere (I know, more gruyere) burger, which both came with our choice of fried potato (waffle fries, steak fries or sweet potato fries). Topped with coleslaw–an interesting choice–the pulled pork sandwich featured large, succulent shards of pork that made for a supremely delectable sandwich. 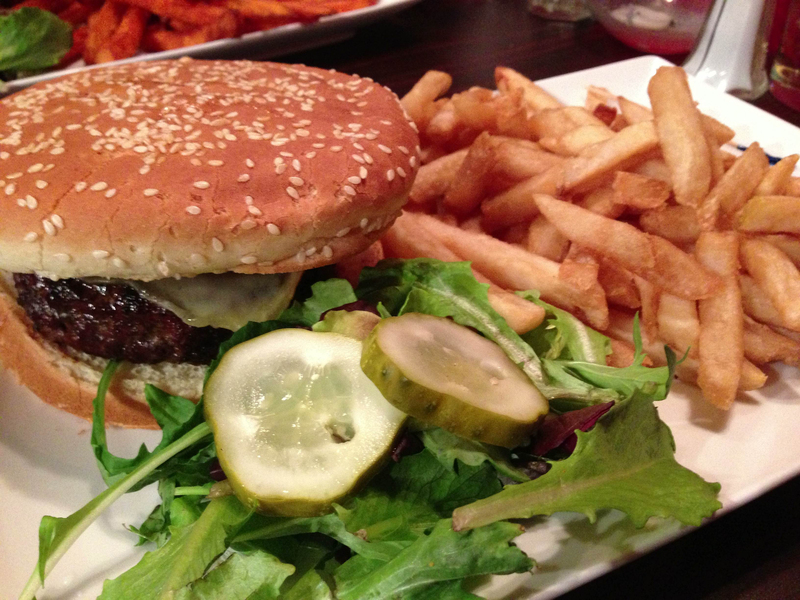 I enjoyed my burger, whose char was so strong, I could barely detect the toppings. My steak fries tasted like they were straight out of a bowling alley of my youth, and the sweet potato fries were incredible. I was so full by the end of the meal that we didn’t get dessert. It’s probably for the better, considering it took us about 15 minutes for the waitress to notice we were finished with our dinners. Don’t get me wrong, I like Wild Turkey Smokehouse, and will probably order food from there sometime. They are, after all, just a few blocks away from my apartment. But, overall, the experience wasn’t stupendous, not that it should have been. But one can always hope. Take the 7 to 40th Street and walk south on 40th Street to 47th Avenue. Turn right. After a long week, we often look forward to Friday nights where we pay someone to cook for us. Unfortunately, Wild Turkey ruined my date night with my wife in splendid fashion. We should’ve known something was wrong when we were the first one’s to arrive for dinner at 7:45pm on Friday. The place was a ghost town. I order a medium Texas Burger and it was nothing special. I heard this place serves 10oz burgers but what I got was a tasteless 4oz brick of dried up meat. Five minutes pass and the burger is back in front of my wife and guess what? All they did was flip the burger over, reapplied the cheese and served it still bleeding to my wife! We once again flag the waiter notifying him for a second time that the burger is undercooked. He takes the burger back downstairs and when he returns, he meagerly offers to take the one burger off the bill and send it home with us in a doggy bag. Like I would trust this establishment again. “Here’s a doggy bag so you can be food poisoned in the comfort of your own home!” I think not. We decided to cut our losses and leave right away. So this is how I spent my friday date night with my wife, reliving the horrors of Wild Turkey pub and writing this review. What a terrible experience! Yeah, that place is not going to last long, I don’t think. I hope you find another place that’s better for your next date night!